The DogSmith is the unrivaled Dog Training, Dog Walking & Pet Care Licensing company. Now operating in the USA, UK and Spain! 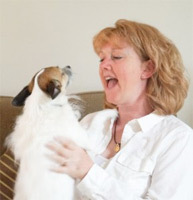 Established by Niki Tudge, a Certified Dog Trainer and Dog Behavior Consultant with extensive corporate experience in Executive Management, Leadership, People Training Skills and Customer Service. Niki is also the Founder of The Pet Professional Guild, the only force-free pet professional association in the United States and DogNostics Career College the educational arm of The DogSmith system. In 2015 Niki was also appointed as the President for Doggone Safe, a non profit organization advocating for dog bite safety. Niki has combined her “people” teaching and dog training skills with her commitment to animal rescue and substantial business knowledge to create a proprietary system of education known as ARRF® supported by an operational implementation process called MTR®. Niki is equipped with a unique combination of business experience, dog training and dog behavior expertise, a background in exceptional customer service, certification as a trainer of trainers and many years consulting to animal rescue groups. She has combined these essential skills and experience to create an unrivaled business opportunity that is designed to provide pet owners with the absolutely most effective method to train and care for their pets while giving back to the community in real and measurable ways while providing a dream life for DogSmith business owners. Business Degrees & MBA from Oxford Brookes University, England. Florida, 2005 to 2007 – Regional Training Director for a collection of Luxury Hotels & Resorts. The Caribbean, 1990 Regional Training Consultant at Sandy Lane Hotel Barbados, Pegasus Jamaica, Forte Hotel Guyana, and Forte Grand Hotel Egypt. Southern Africa,1999 Business Consultant and Project Manager, Travel Industry and Game Reserves, Gauteng, South Africa and Nigeria. The Middle East 1994 Business & Management Training Consultant in Cairo, Jordan, Cyprus & Abu Dhabi.